The ultra-violet (UV) images of shoe 229.1955 show an other all blue/white fluorescence indicating the presence of a fatty bloom or a preservative coating. The fluorescence is particularly clear within the crack in the leather on the underside of the shoe, possibly as a result of a build up of the material in these regions. A small sample of wood was collected from shoe 229.1955 and analysed using Energy Dispersive X-ray (EDX) analysis. The series of images above indicate the distribution of a range of elements present in the sample. The absence of chromium in this sample, indicates that the leather used to make the shoe was not tanned using this method (as expected for a shoe of potential medieval origin). 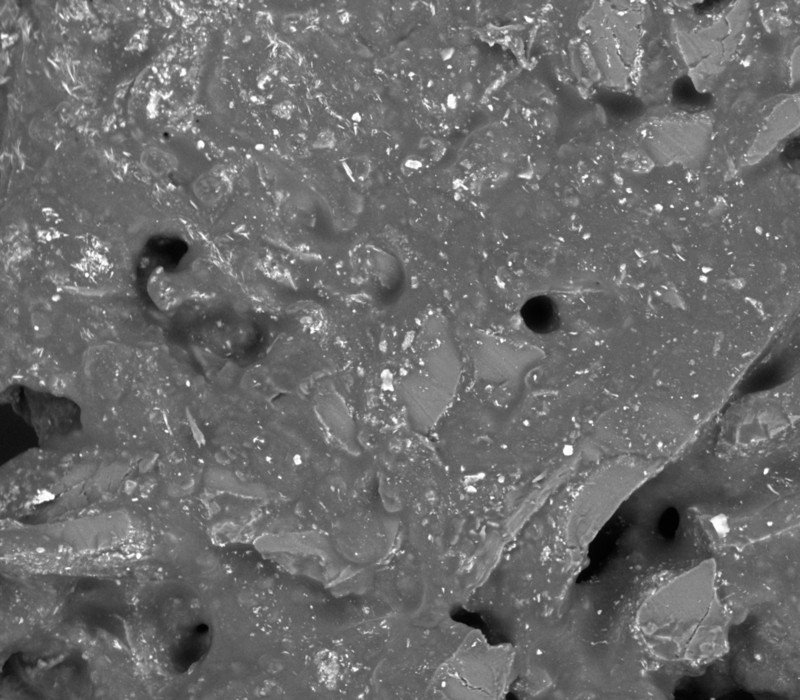 The trace aluminium identified in the sample may relate to the presence of embedded clay particles such as kalonite. The FTIR spectrum for cow leather above (brown) includes a number of bands that facilitate comparative analysis of unknown samples. The relative intensity of the some bands can also indicate the state of preservation for the material. As shown above, cow leather has a strong band centred over 3300cm-1, known as the amine band, that relates to stretching of the =N-H group in the proteinaceous component of the leather. A series of three decreasingly intense bands at 1651, 1550, and 1340cm-1 are referred to as Amide bands I-III respectively, and are useful indicators of the protein content in a leather sample. The sharp peak at 2912cm-1 relates to asymmetric stretching of =NH and – CH3, –CH2 groups, while the peak at 2858cm-1 is assigned to symmetric stretching of –CH2–groups. Additional prominent peaks include one at 1742cm-1 relating to the –COOH un-ionized group, a band at 1448cm-1 related to bonding oscillations of –CH3, and –CH2– groups, and a pair of peaks at 1088 and 1028 that refer to stretching of C–O or –C=S groups (Bienkiewicz, 1983). As can be seen in the spectra above, there is some variation between the reference spectrum for cow leather (brown) and the sample collected from shoe 229.1955 (blue). The peaks relating the the proteinaceous component of the leather (3300, 1651, 1550, and 1340cm-1) are reduced in intensity. This suggests that the collagen component in this sample has undergone partial proteolysis. The peaks at 2912 and 2858 cm-1 while present, are also somewhat reduced in comparison to the cow leather reference sample. The peak at 1742cm-1 is much increased, indicating increased acidity in the sample. The fingerprint region in spectrum 229.1955.1 (blue) is somewhat complex, but there are a number of peaks visible in the detailed image above showing the spectral range from 1600-600cm-1. These peaks correspond with oleic acid (pink) and linoleic acid (green), and likely relate to the deposition of deteriorated fatty components on the surface of the leather. There is no indication of post collection contaminants in the FTIR spectrum for shoe 229.1955. Mass spectrum showing peaks at 2853 and 3033 m/z, indicative of cattle. A sub-sample of the leather collected from shoe 229.1955 was analysed using ZooMS at the Department of Bio-Archaeology, University of York. In this technique the sample is chemically processed to extract the collagen component of the leather. The collagen component is vaporised using a laser in a process known as Matrix Assisted Laser Desorption/Ionization (MALDI), and the ions generated from the sample are analysed using time of flight mass spectrometry (TOF-MS). The velocity of the ions as they pass through the drift space in the mass spectrometer is determined by their specific charge to mass ratios. Thus the ions are detected at specific points on the spectrum according to their specific charge to mass ratio. As the amino acid sequence of collagen is unique to every species, so too are the ions generating during vaporisation. The appearance of specific peaks on the mass spectrum is therefore indicative of particular species. Spectral peaks derived from the sample are compared against a database of known species mass spectra to indicate the species of the leather. The peak at 2853 and 3033 m/z in the mass spectrum above (green) are indicative of cattle. The animal species from which the shoe 229.1955 was produced is Bos taurus.